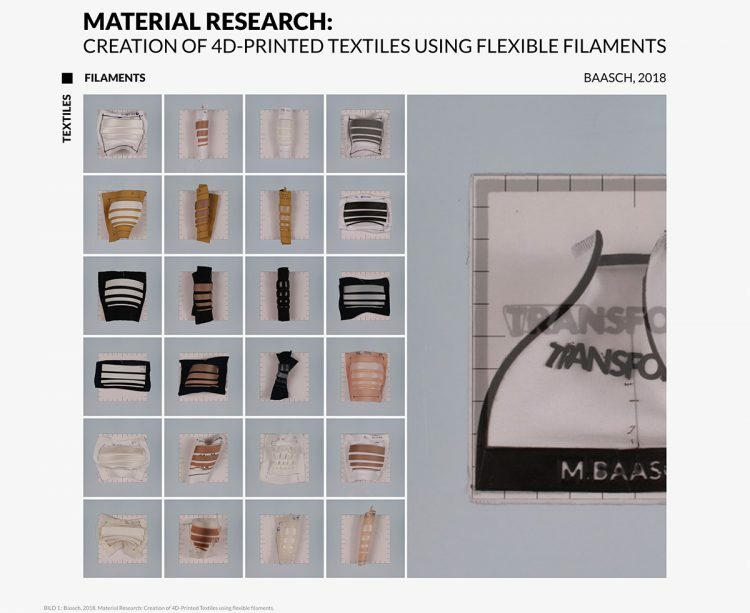 The research explores the behavior of 4D-Textiles by printing flexible filaments on bi-elastic Textiles using the FDM. The purpose is to find a material combination that builds a flexible and strong structure for a 4D-Shoe design. The investigation refers to the concept of Activeshoes  for the production of 4D-programable objects. It also bases on “Direct 3D printing of polymers onto textiles”  where traditional filaments are examined. For the test, six filaments are applied on ten textiles. 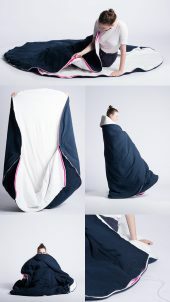 One single pattern is printed at different heights (L); the fabric’s side and orientation are considered. A broad evaluation of PLA on cotton is made to compare with the other material combinations. Thus, an irregular matrix of ninety samples is generated. The results are analyzed according to the amount of deformation, print quality and stiffness of the structure (Bild 2-6). The author concludes that TPE printed on Romanit-Jersey builds flexible and defined forms appropriate for the shoe-design.